Damn Arbor: Is Ann Arbor arbitrarily redacting information in FOIAed documents? Is Ann Arbor arbitrarily redacting information in FOIAed documents? In justifying the redactions in the list, the City cited privacy concerns. It seems strange that the City would want to shield the identities of folks who have requested very personal non-redacted information about voters. 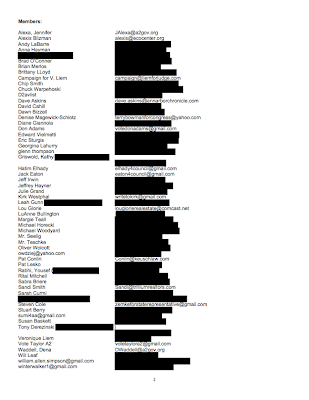 Also, if you look at the redactions in the list above, it looks like the email addresses of people who requested the AV Fist have been more, or less arbitrarily redacting some of them. Also, why has the City completely redacted the names of two entities who have requested the AV File? It a waste of staff time and city resources to redact information that should be available to the public. Don't fear gentle reader, Ed has appealed the redactions in his FOIA request. We'll keep you posted. Worth noting that the post on Ed's blog (http://vielmetti.typepad.com/vacuum/2014/11/appeal-of-foia-14-315-redaction-of-names-and-email-addresses.html) has a copy of his appeal letter. Ed Vielmetti is appealing up the wrong tree on this one. I can tell you that my name on the list is, largely, due to not having gotten around to asking for its removal. I know others on that list would tell you the same thing. I absolutely believe the city is obligated by the state's FOIA statute to redact email addresses of people who are non-city employees. In every FOIA I have made that included email addresses of city employees and non-city people, the non-city employee email addresses have been redacted, and correctly so. I have requested public requests released to others (to test a similar hypothesis) and have found this particular redaction is used uniformly. Private email addresses are not public records, even if they are contained in public records. That there are elected officials on this list, however, leads to the question of whether the Clerk is sending absentee voter lists to their city or county email addresses. This would be a violation of campaign finance law as they are forbidden from using public resources for their private campaigns. It would be easy to test this using FOIA by asking for the names and addresses of public officials who are using city of Ann Arbor or Washtenaw County email addresses to receive the AV lists. City, county and school officials are not arbitrarily redacting in my experience; they are shielding and withholding public records by assessing high fees and dragging out the process. Re: "I absolutely believe the city is obligated by the state's FOIA statute to redact email addresses of people who are non-city employees." This reflects a basic misunderstanding about what the purpose of the FOIA is as well as the legislation's basic architecture. Specifically, Michigan's FOIA itself contains no requirements that a public body redact information. The FOIA contains allowable exemptions to the general mandate that all records held by public bodies must be disclosed on request. Among the allowable exceptions to the FOIA's general disclosure requirement are categories of exemptions described under the mantle of information that other statutes or laws expressly prohibit disclosing. (e.g., SS numbers). In the case of the redacted email addresses in the city's response to Mr. Vielmetti, the city is not meeting an obligation it has under the FOIA, but rather choosing, at its discretion, to apply an exemption allowed under the FOIA. That exemption is the one based on the idea that to disclose the information would constitute a clearly unwarranted invasion of privacy. So the correct three questions to ask are: Would disclosure of the email address invade privacy? Would the putative invasion of privacy be unwarranted? And is there some public interest in disclosure that outweighs an interest in privacy? The city appears in some cases to have chosen to redact both pieces of information – name and email address – so that the identity of a recipient of the AV list is completely shielded from public view. A straightforward argument that the identity of a recipient to the AV list should be disclosed (in the form of the person's name or email address) is that a potential invasion of privacy would be warranted – by a public interest in knowing who is potentially contacting voters en masse seeking to influence them – because knowing who might be potentially trying to influence voters in this manner contributes to full and complete information regarding the affairs of government (of the people, by the people, etc.) And supporting the public's right to full and complete information regarding the affairs of government is actually the core purpose of Michigan's FOIA. An argument that the "private email addresses" redacted here are required to be disclosed under FOIA could be based on the simple assertion that disclosing someone's email address is not an invasion of the person's privacy. Exhibit A: Mr. Vielmetti's own email address. An additional argument that the "private email addresses" redacted here should be disclosed under FOIA is that a member of the public has a legitimate interest in contacting the individuals who receive the list – to ask them to what purpose they are putting the AV list. Those individuals have every right to refuse to answer an emailed inquiry, but the point is that a member of the public has a legitimate interest in being able to contact a list recipient, without doing extra research. And suffering the "invasion of privacy" that would result from having an email show up in your inbox asking you how you are using the AV list hardly seems like a real invasion of privacy. In fact, sending an email query seems like the least intrusive way for someone to make contact in this day and age. Finally, in the case of the email addresses that have been redacted by the city in responding to Mr. Vielmetti, it's not evident the city is using a uniform set of criteria to effect its redactions. For example, Westphal's address doesn't seem to fit the pattern of political campaigns or else some public entity. The city has actually granted appeals in the last few years based on claims of arbitrariness, so Vielmetti is right to appeal on those grounds. In conclusion: Point to Vielmetti.